Fendi will be playing quite a role in the event this year, introducing the F Factory, a limited-edition retail project in the Miami Design District’s Moore Building (home to Zaha Hadid’s “Elastica” permanent exhibition), starting November 30 2009 and running until Christmas. The shop will feature the brand’s most coveted bags, complete with Fendi’s Roman craftsmen on-site to personalize each one. But in true Basel form, art and culture will infuse the retail. 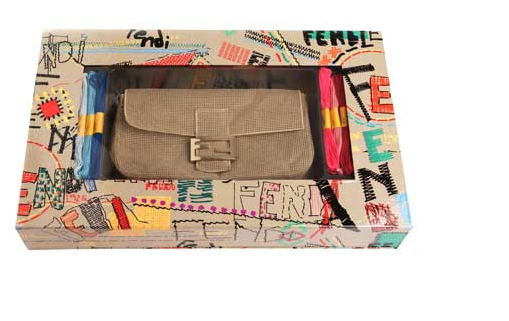 Graffiti artist Andre is creating three needlepoint panels live in three 60-minute “performances” in the space, which will then be stitched into a unique Fendi bag. 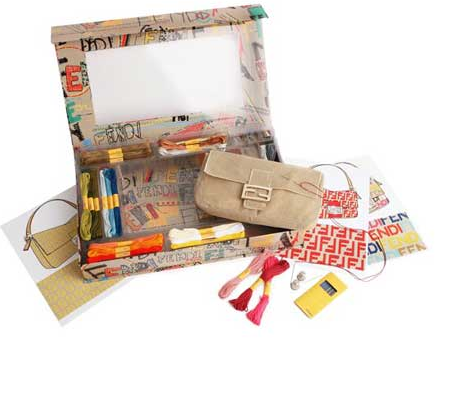 You can buy your own Fendi Baguette Needlepoint Stitch Kit, designed by Silvia Venturini Fendi for $995! Other collaborations include Moritz Waldemeyer’s collaboration with Fendi to create six custom-made Gibson guitars with Silvia Venturini Fendi, which will project lights on the walls when played by American band OK Go. The Limited Edition Experiences program in the Miami Design District. Launched by Dacra, a real estate company that owns 80% of the 18-block area that constitutes the Miami Design District, Miami’s Limited Edition Experiences program brings together designers like Cynthia Rowley,Duncan Quinn, Christopher Ross, Maison Martin Margiela, and Marni, all of whom engage consumers with a series of initiatives ranging from pop-up stores to limited-edition wares, in-store events, documentary screenings, and more. Luxury fashion engaging in experiential goods and services… could this be the new Eco Luxury market of the future? I can’t wait to see how these pop up projects proceed! San Francisco – Online retailer Tobi.com has launched a virtual fitting room that can be accessed from the home. Customers can try items on through innovative use of a webcam and motion sensors are used to rate styles with the wave of a hand. They can also post pictures immediately to Facebook in order to see what friends think. I have been meaning to do a blog entry about Mortiz Waldemeyer’s work for some time. I first heard him present his work during a keynote at the ISEA09 event in Belfast this summer… I was lucky enough to hear him present again at Central Saint Martins a few weeks ago, which was even more engaging and inspiring! He is the technical “know how” behind many high end fashion and interior collaborative projects that can truly be defined as “cutting edge”. The projects were introduced with an explanation of the original concept, the methods of production and a concluded with reflection of how the end outcome performed and was received. I thought this was a really inspiring and insightful way to present such unique creations. For example an interactive LED chandelier embellished with swarovski crystals, designed to display text messages. A project with Zaha Hadid (pictured above) to design LED technology into Zaha’s futuristic kitchen interiors. He has received commissions from the music industry to integrate laser technology into clothing for Mika’s music video and was recently invited to design a laser jacket for Bono’s stage performance. A lot of his project’s have been heavily financed and supported by the likes of swarovski without which it would have been impossible to produce as the level of manpower, technical skill and material cost exceeds traditional production processes above and beyond! The projects were introduced with an explanation of the original concept, the methods of production and a concluded with reflection of how the end outcome performed and was received. I thought this was a really inspiring and insightful way to present such unique creations. I was blown away by the level of skill, technical ability, methodical thinking and innovation invested in each of these projects… He uses LED technology is alternative ways and really pushes the boundaries to help others realise a concept and make it a reality. For further explorations check out his blog or follow his tweets. I am off to Belfast, Ireland this week to the International Symposium of Electronic Art 09 where I will be presenting my first academic paper! The ISEA is a non profit organisation promoting interdisciplinary action through academic discourse and promoting a dialogue through the disciplines of art, design, science and emerging technologies. I will be presenting in the third Interactive Textiles category which explores collaboration, cross-disciplinarity and consumption. My paper reviews participatory design methods for fashion support by digital media and sustainability will be a central theme throughout my presentation. I’m really excited to be attending this event as they have some really amazing key note speakers lined up. Clive van Heerden , the Senior Director of Design-Led Innovation at Philips and responsible for leading the Philips Design Probes program will be presenting on Wednesday and Thursday will host Moritz Waldemeyer, the engineer behind Hussein Chalayan’s futuristic fashion creations. The are a series of Fashion and Textiles sessions exploring time and form, materiality and wearability and lastly, adoption and collaboration, cross disciplinarity and consumption.And that’s just a summary of the Textile categories, there are many more presentations and workshops within other disciplines. I cant wait to experience this action packed week! Running parallel to this digital exploration I am going to try out another digital experience – twitter! I will try my hand at some micro blogging photos and comments live from ISEA09 for the duration of the week… Bye, bye and tweet to you later! 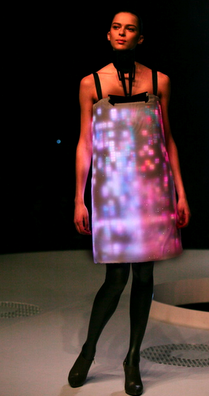 Pa++ern is a project (launched by Daito Manabe and Motoi Ishibashi) which allows users to customise a t-shirt via twitter. It’s an interesting mode of interaction which combines digital media and an existing social networking platform to captivate an audience. Syncing twitter with their digital sewing tool is fitting as it has been ranked the 3rd most popular social networking site and 50Th most popular website in the world! 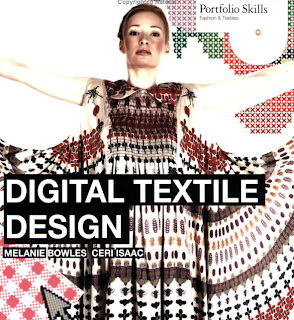 I have just received a new book from amazon: Digital Textile Design by Melanie Bowles. This book is beautifully illustrated showcasing students from Chelsea College of Art & Designs work. 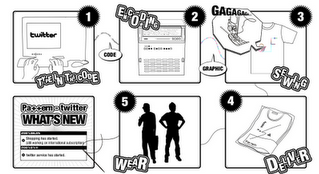 It provides expert knowledge and “know how” with detailed instructions for Adobe Photoshop and Illustrator. I loved how there is a balance between the process and the practice as it presents a sense of how each technique can be applied. Being from a Constructed Textile background I think this will be a great tool for my practice and research. I can’t wait to work through some of the methods!